the imminent publication of our first book. Shangri-La, A Photographic Essay, is a study of Diqing Prefecture from the conservationist’s point of view. Ms. Sahra Malik was commissioned to produce a book to highlight the beautiful scenery of Diqing Prefecture and to give a glimpse of the fascinating cultural heritage of the people living in the region. 85 percent of the population is of Khampa Tibetan origin. Other strong ethnic groups make up the remaining 15 per cent including Naxi, Lisu, Muoso, Yi, and a number of others. These groups each have unique cultural practices and often speak their own language. A fragile, high altitude eco-system and colorful lifestyle are the themes in Sahra’s latest work. Delicate flowers in a strong composition, dark eyes of the farmer woman who interrupts her field work long enough for a photograph, vista of lush summer landscape dotted with fine stone dwellings all remind us that there are still wild and beautiful places on our planet where local people live in harmony with nature. Sahra Malik, photographer and graphic artist, presently lives in London. She will complete her Master of Arts degree at Central St Martin’s, London School of Art in May 2007. Sahra lived in Beijing for two years after graduating from New York University with a BA in Photography. She taught Graphic Design at Raffles LaSalle University and has worked as a freelance designer for a local textile company during her stay in China. YMHF works on eco-tourism projects which focus on preserving this harmony yet promotes improved opportunities for people. Our goal is to see the greater area protected under a national park plan. 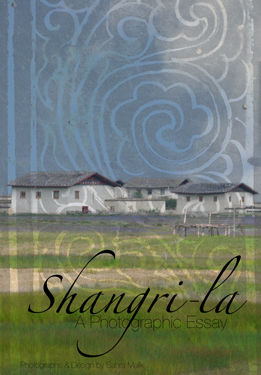 We have commissioned this work to bring Shangri-La to the world and to encourage others to contribute to our efforts.